The Predator is a third-party light gun for the Sega Saturn and PlayStation. 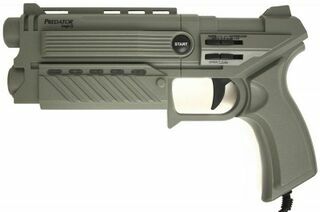 It has been rebranded several times - as the Predator by Logic 3, the Virtual Gun (not to be confused with the official Virtua Gun) by Nuby and the Cobra Gun by Nyko. There is also a Predator 2, which from a Saturn perspective is much the same, but adds vibration for PlayStation users.